Traveling in similar circles in the fertile Brooklyn scene, guitarist Mary Halvorson and violist Jessica Pavone's shared formative experiences can be traced to the influence of composer Anthony Braxton. Since then, numerous eclectic collaborations with fellow Braxton-alumni cornetist Taylor Ho Bynum have ensued, with all three serving as current members of Braxton's varied line-ups. As testament to their diverse backgrounds, neither Halvorson nor Pavone are constrained by any one particular style or approach. Halvorson's penchant for the primal rawness of rock has been demonstrated in bassist Trevor Dunn's Trio Convulsant and her own power trio, documented on Dragon's Head (Firehouse 12, 2008). Pavone's neo-classical inclinations are apparent in her own solo releases and string quartet writing, as is an interest in '60s soul with her sextet, The Pavones. In this spare duo format they channel their focus, blending plain-song vocal harmonies and melancholy themes with angular intervals and caterwauling interludes, yielding a singular yet cohesive hybrid. Less prototypical jazz than avant folk buttressed by unorthodox arrangements and aleatoric improvisation, Thin Air is their third duo recording, following On and Off (Skirl, 2007) and Prairies (Lucky Kitchen, 2005). Sharing vocal duties, they sing oblique cadences in harmonious polyphony, yielding a hauntingly poignant tonality. Their lyrics alternate from the abstract to the concrete, an aesthetic mirrored by their instrumental work. A singular guitarist, Halvorson alternates between fractured chords and spidery leads, peppering the tunes with grating bursts of distortion and feedbackamplifying the session's somber acoustic patina with a dose of crass modernity. Pavone's lyrical glissandi resound with a graceful lilting chiaroscuro, buoying pliant themes with a sinewy, bittersweet tone when not writhing through labyrinthine structures. As longstanding accomplices, each musician's turn of phrase, sudden pause and change in pitch reveals a level of interplay that borders on the clairvoyant. The title track is telling; oscillating between gorgeous vocal harmonies and acerbic string deconstructions, they fluctuate between ethereal delicacy and impetuous chaos. As their lyrical refrains intensify, their instrumental accompaniment grows more agitatedHalvorson runs her scrawled fretboard assaults through EFX pedals, unleashing coiled loops of caustic feedback that Pavone accents with strident double-stops. Other cuts are equally beguiling and sonically varied. The dramatic dirge "Sinking" modulates from dolorous long tones to coruscating peaks. Just before the coda, Halvorson and Pavone break into a few poetic verses before ending the tune on a dark, forlorn note. Despite their limited instrumental palette, their dynamic range is vast, veering from the spasmodically violent pointillism of "Barber" to the lush "Lullaby" and "...and Goodnight," heartwarming sketches of Americana that conclude the album with a glimmer of hope. Conceived by artists who operate outside labels, Thin Air is a record, in the immortal words of Duke Ellington, simply "beyond category." Track Listing: For You or Them; Thin Air; Juice; Barber; Sinking; Ten years; Lullaby: ...and Goodnight. 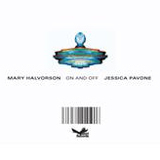 Personnel: Mary Halvorson: guitar, vocals; Jessica Pavone: viola, vocals.